Sai Thy Kingdom Come - The Reappearance of Sri Sathya Sai Baba - "Your prayers will pull Me in to this form again"! HomeArticlesAll Articles"Your prayers will pull Me in to this form again"! Three days after Swami left His body, I received an email from a close friend with the contents of a letter that supposedly materialized in a devotee’s home in Chennai, India. 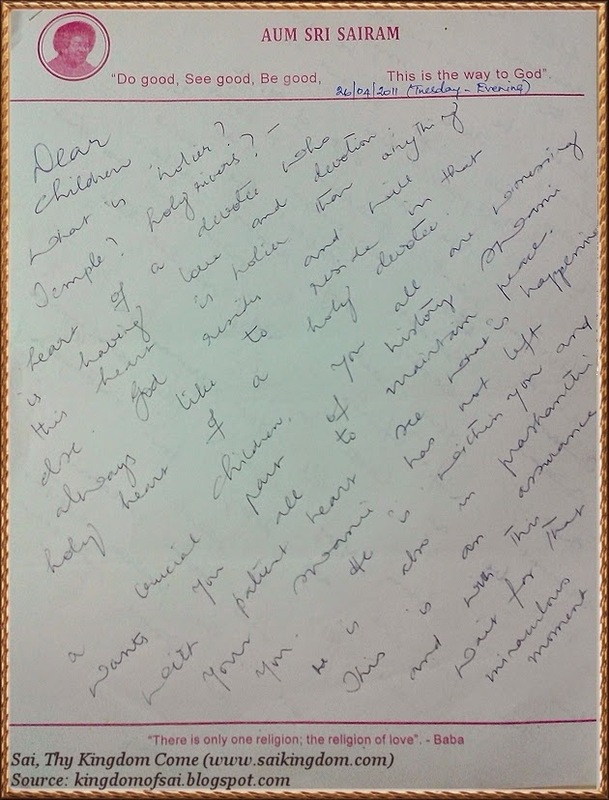 Even though the email did not have a copy attached, the original letter was said to be in Swami’s hand writing. The message in the letter was so astounding that I decided to trace its source and verify the authenticity. However after much fruitless effort I abandoned the quest and abstained from sharing the letter without its legitimacy verified. I had all but forgotten about the letter until a few weeks ago when Brother Aravind Jayaraman who helps with the distribution of Sai Thy Kingdom Come Tamil, received a call from a Sai brother in Chennai enquiring about the book. From their discussion Aravind learnt of the various miracles that are happening in this devotee’s home and how Swami has confirmed to them His reappearance in the Sathya Sai form. 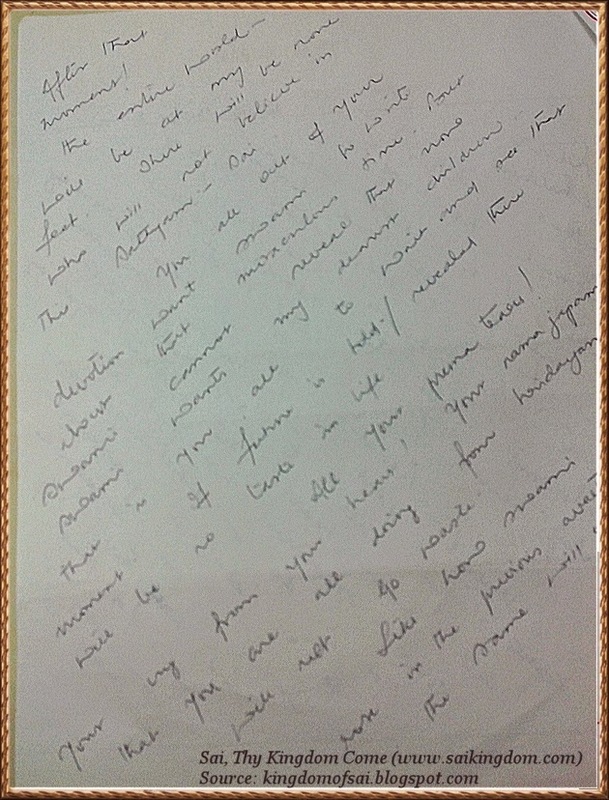 The devotee also mentioned about messages in Swami’s handwriting appearing in their home. When Aravind told me about this, I was really anxious to talk to this devotee and contacted him over the phone. During our discussion I enquired whether a certain letter had materialized in his home a few days after the Mahasamadhi. As per his request I provided the contents of the letter for him to verify. He immediately confirmed that it was indeed in his house that this letter emerged! He also added that the letter was not meant to be publicized but somehow its contents, despite being shared privately, were circulating through emails. Later Aravind visited this house and personally verified the happenings. There he experienced certain miracles including messages in apparent handwriting of Swami appearing on a writing-board kept at their home and on a letter pad placed at their altar. 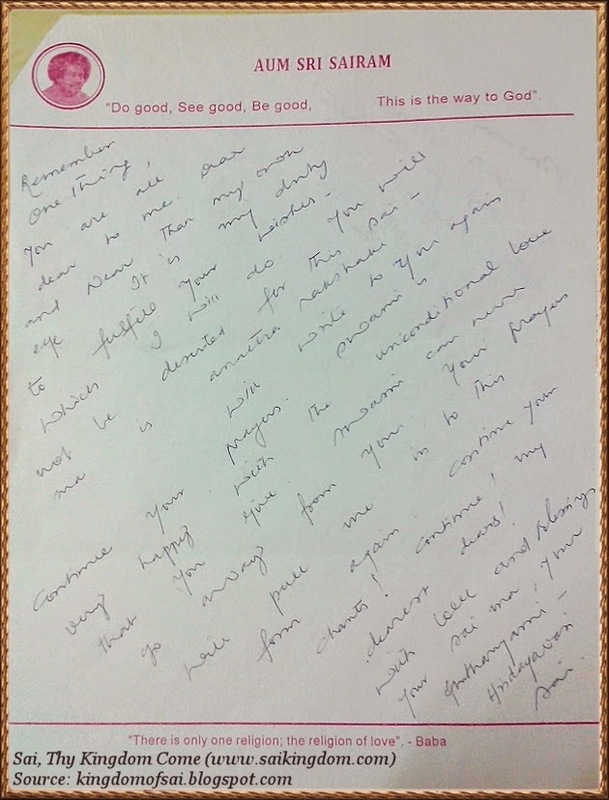 Aravind also learnt that sometimes when a question is written and kept at the altar, the answer would mysteriously appear in Swami’s handwriting at a later time. Some minutes ago, Swami had written that the letter can be announced. Though this has reached many devotees before this confirmation HE has given (it) now (which is again His leela). We are happy to let you know this. Sairam. Please proceed with the same and let's all wait with folded hands and pray for His grand return. What is holier? Temple? Holy rivers? – heart of a devotee who is having love and devotion, this heart is holier than anything else. God resides and will always like to reside in that holy heart of a holy devotee. Children, you all are witnessing a crucial part of history. Swami wants you all to maintain peace. With patient heart see what is happening. Your Swami has not left you. He is within you and he is also in prashanthi. This is an assurance and with this wait for that miraculous moment. After that moment! the entire world - will be at my feet. There will be none who will not believe in this Sathyam - Sai. You all out of your devotion want Swami to write about that miraculous time. But Swami cannot reveal that now. Swami wants my dearest children that is you all to wait and see that moment. If future is told / revealed there will be no taste in life. All your Prema tears! Your cry from your heart!, Your nama japam that you all are doing from hridayam will not go waste. Like how Swami rose in the previous avatar the same will occur. Remember one thing, you all are dear to me. Dear and Near than my own eye. It is my duty to fulfill your wishes. Which I will do. You will not be deserted for your Sai Ma is anatha rakshaki. Will write to you again. Continue your prayers. Swami is very happy with the unconditional love that you give. Swami can never go away from you. Your prayers will pull Me in to this form again. Continue your chants! Continue! My dearest dears! "Like the coldness of the atmosphere which freezes the water, the compelling agony of the devotee's heart solidifies the Niraakaar (Formless Absolute) into the shape and the attitude that are yearned for. "Yadh bhaavare, thath bhavathi" ---"as felt, so fashioned." He bows to your will, He carries your burden, provided you trust Him with it. ~ Sathya Sai Baba, - Prashanthi Nilayam, Birthday Festival, 23-11-1960 . Wow. I just re-read the Article here in our STKC website titled "Your Prayers Will Pull Me Into This Form Again"
I encourage everyone to re-read this truly lovely and miraculous story. It is so heart-warming and true. Anybody who knows Aravind, and his type of fully devoted Sai friends, will know that this whole story is honest and true. Wow. Sai Ram Sai Ram Sai Ram Praise God. Sairam.. have there been any further messages from swami int he form of letters? Please do share...! "Will write to you again. Continue your prayers..."
Sairam! True and sincere devotees will rely upon Swami's assurances. Let us wait for the glorious time which is really confidential as far as Swami is concerned. Yes, the charm will fade, if we know beforehand the outcome. Games are watched all over the globe for the shear ecstacy of the twists and turns. Hence match fixing is seen as a serious crime. "Love My uncertainty" - Swami. Swami will come at the most unexpected hour. Om Sri Sai Ram. "Will write to you again. Continue your prayers." Swami.... eagerly waiting for Your message.